Make Group Ordering SO Easy! Simplify getting your group's order together with Better Life's Shared Order™! Just pick the design you want and let each person choose and pay for their own shirt - we'll take care of the rest. Login to Your Account. You must be a registered Better Life or WorkPlacePro customer, so if you don't have an account yet, now is a great time to create one! 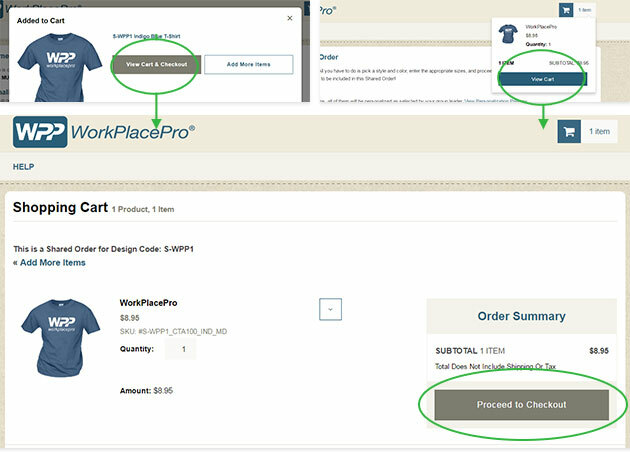 Once you're signed in, go to the product page for the design you want, and click the "Set Up a Shared Order" button. The setup wizard will appear to walk you through the process in a few easy steps. Start with your shipping address - all the items for your group will be sent to the address entered. Choose whether you want your items personalized. All items in your shared order will receive what YOU choose. If you picked personalization, type in the text you want. Then Preview what it will look like, and choose to either "Re-Do" and make changes, or "Accept" what you see. Note that you need at least 12 items total to meet the personalization minimum, so encourage everyone to participate! Take one more look at all your information to make sure it's corrrect, and enter your promo code if you have one. If everything looks good, click Submit! Check your inbox and share the link! An email with your unique Shared Order Link should arrive within 1 business day. You can simply forward that email to your group to let them know it's time to order, along with any comments you want to add. Each person can pick their own items and pay individually. Remember to order for yourself! Don't forget: the first step was creating the shared order, so you must use the link to order for yourself too! We'll keep you updated on how you're doing: one week before your deadline, you'll get an email letting you know who's ordered so far. It's a good time to remind your group members to put their orders in before it's too late! After the deadline, you'll get a final email with the complete list of items from your group. We'll take care of grouping everything together and ship your items out about two weeks after the deadline. Your package will include a summary sheet letting you know who gets what to make handing everything out a breeze. 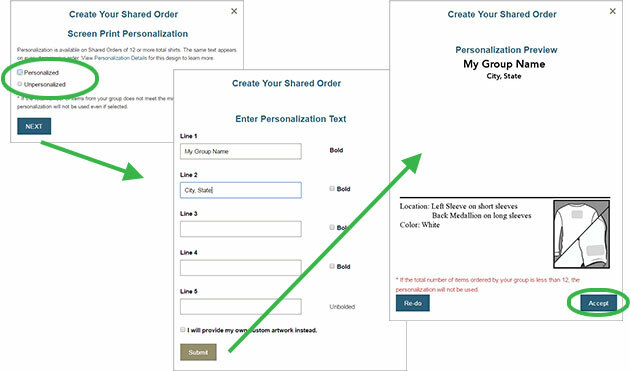 You will receive an email from your group leader sending you the unique link for your group's shared order! Click the link in the email to go to your group's exclusive order page. Make sure you do so by the deadline date listed in the email! Pick the items you want by clicking on the color to see sizes and enter how many you want in the quantity boxes. Once you're set, add the items to your Cart. When ready, you can View your Cart and Proceed to Checkout. Login if you have an account, or if not, either create one or check out as a Guest. 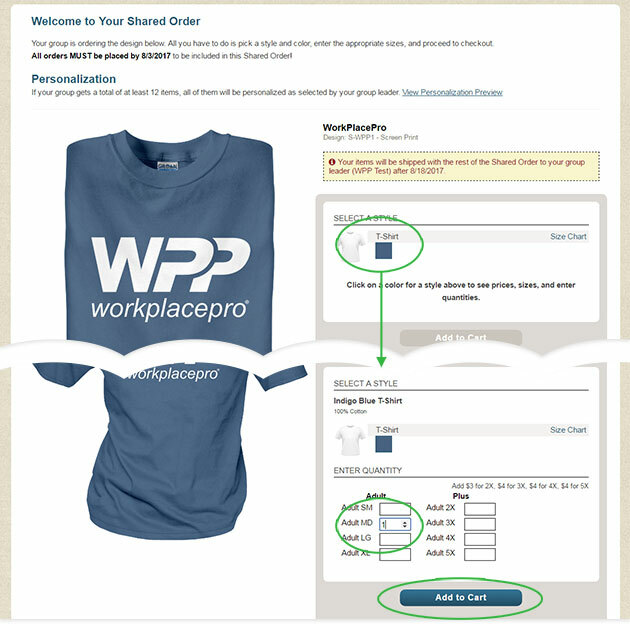 No need to enter a shipping address - your items will be sent together with the rest of your group to the address shown. Click "Continue" to fill out your Payment Method and Billing Address. Review all your information and click "Place Order" if everything is correct. You're all done! Sit back and let your group leader handle the rest! All items will be shipped to your leader about 2 weeks after the deadline date.